The Great Barrier Reef Marine Park Authority has taken an important step in its reconciliation journey, with the release of its first Reflect Reconciliation Action Plan. The Reconciliation Action Plan was developed to translate the Authority’s values into practical and intentional actions that will contribute to reconciliation within the Authority and with Aboriginal and Torres Strait Islanders. Authority staff and Reconciliation Australia helped develop the Plan. The preparation of the Reconciliation Action Plan is also about providing a supportive environment for all staff to ensure they feel respected and valued, and also recognising the Traditional Owners who work with the Authority to manage sea country. While this signifies the formal beginning of the Authority’s journey to reconciliation, it builds on more than 40 years of previous experience and initiatives. The front cover of the Plan features commissioned artwork created by Nicky Bidju Pryor, a Juru Traditional Owner. 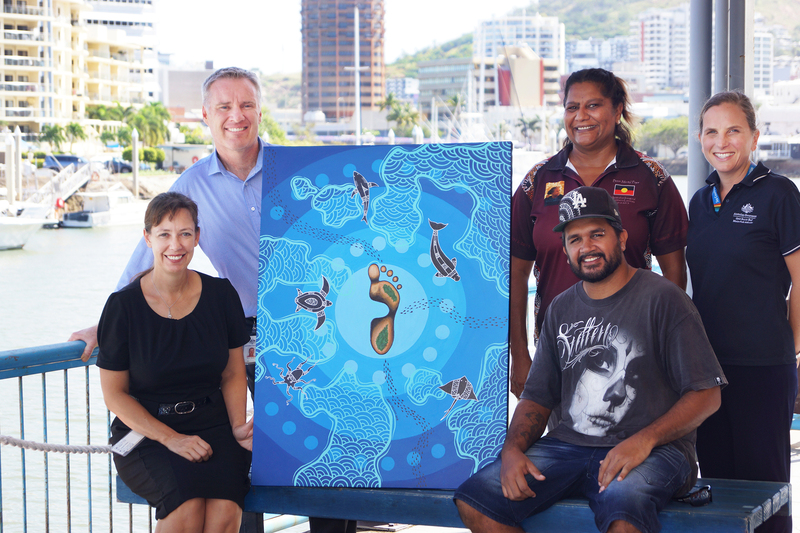 The artwork represents the Authority’s reconciliation story, encompassing a central island with a footprint as the focal point and the ripples of change needed by taking a step — linking to animals that represent the life in and around the Reef. The Authority commissioned the below artwork as part of our commitment to implement its Reconciliation Action Plan. The artwork represents the Authority's story in an Aboriginal way. The foot is shown as a group of islands which depicts the step we need to take to make change for the good of the Great Barrier Reef. The different blue colours in the background represent a ripple in the water. This indicates the change that will happen if we take a step now. The animals represent the life in and around the Reef. The aqua-coloured lines represent the Great Barrier Reef coming to life.